The Kowaka version of the story of young samurai Atsumori, is an authentic taste of Samurai life—living with the spiritual reality of imminent death. In the Noh version, the ghost of the slain Atsumori returns to confront his enemy, only realizing in the Buddha that there are no enemies. The use of poetry to indirectly suggest seasons, cosmic cycles, religious truths, and personal situation is a characteristic of Japanese classical poetry. The tragic tale of young Atsumori of the Taira clan, a noble and refined youth who fell at the hands of the renowned samurai Kumagae of the Minamoto clan, is bittersweet for its extolling of refinements, profound changes of heart, and death at so young an age, merely 16. The facts are true and simple. In the 12th century, Japan was in the throes of civil war, pitting the ruling Taira clan against the Minamoto. 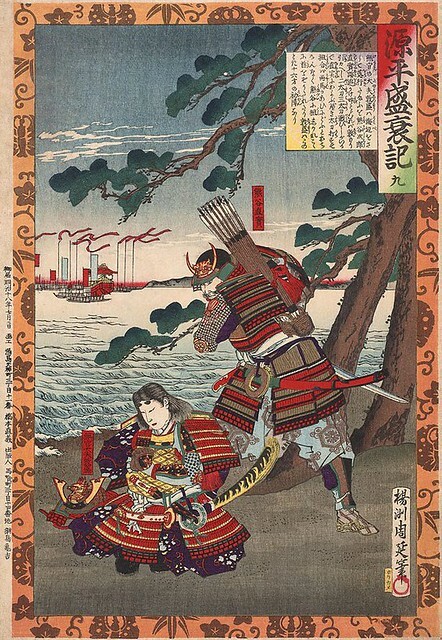 The Heike Monogotari, or Tale of the Heike, recounts the fateful battle of Ichi no Tani at Sumo Bay, where the Minamoto routed the Taira, who fled back to their departing ships. 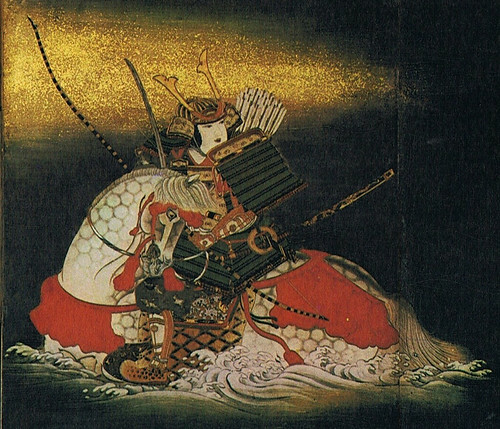 Young Atsumori, a courtier praised as the finest flute player and so possessor of a rare and excellent flute, noticed that he had dropped his flute while returning to the ships on horseback through the roaring waves. So he retuned to retrieve it. In this, his youth, his naiveté, and his refinement are apparent. Taira no Atsumori riding through the waves. Fatefully, he encountered none other than the most ferocious and fearsome warrior, Naozane no Kumagae, master samurai of the Minamoto clan. It is this encounter in the surf, between young noble Atsumori and seasoned martial artist Kumagae, that is retold in the literary traditions of two distinct Japanese performance forms, the archaic samurai entertainment, Kowaka, and later, the rarified multi-artform Noh theater. 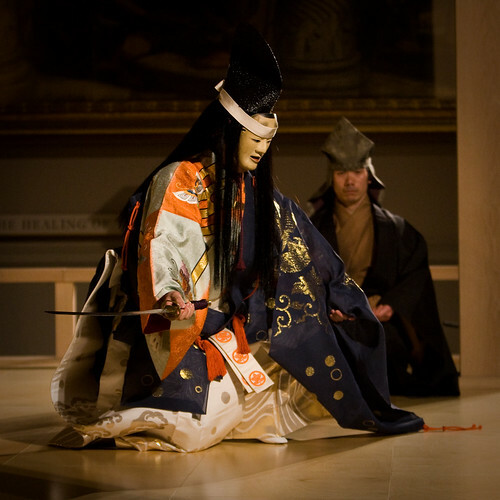 The Kowaka tradition places a Buddhist framework on the tragedy—an historically true one—where the Noh play takes Buddhism a step farther, when the samurai-turned-monk encounters the ghost of Atsumori to re-enact the battle. Among the surf of the shore. Has turned and brought him back. Kumagae at length learns it is the elegant and educated courtier Atsumori. The samurai protocol breaks down. Kumagae sees no enemy, but a refined young man, more mature and worthy than his own son, and the karmic entwining of their lives by his killing the boy is a spiritual realization that the warrior, for once in his life, cannot bear. But the boy will have none of it, as battle rages around them. Both are expected to behave as samurai, and for only that high principle of life did Atsumori enter battle, his very first. Atsumori would live and die as an example of honor. And so, agreeing to their karmic destiny, Kumagae beheads Atsumori, only after vowing to leave the military life, to become a monk and pray for Atsumori’s escaping the Wheel of Life and Death. He returned to his chief and delivered the head. The Death of Atsumori, by Chikanobu Yoshu, 1885. Woodcut print. Upon seeing the head displayed, Kumagae’s worldview disintegrated, vanishing like all fleeting things of this world. Indeed, their karma had been sealed during the battle exchange, but this bond would continue, evolve, and heal. The mighty Kumagae left the life of the literati and samurai for that of a monk. He entered Kurodani-ji, a temple in Kyoto, took the priestly name Rensho, and there prayed for Atsumori’s arrival in the Tushita heaven. Later in life he made the pilgrimage to the sacred mountain Koya San, where he interred Atsumori’s ashes and built a temple to their eventual unity in the Buddha, when, joined in enlightenment, the two would be united in the One Lotus. Kowaka was a military entertainment, simply performed by standing, walking, stamping, all of which punctuate the telling of a Buddhist martial story. Ancient ways of warfare were imbued with a sense of honor. The samurai fought according to one honorable code. They knew that tomorrow’s battles would bring death to their group. Not everyone would return to camp. The tragic story of Atsumori was one such tale told on the eve of battle. It was to remind the samurai of the transience of life, the honor of living, and Buddhist transcendence awaiting all.